One of the best ways to exercise while you are on vacation or living near a body of water while enjoying the thrills of communing with nature is the kayak. Similar to canoes, kayaks are small sailings vessels, usually manned by one of two people using a double bladed paddle. The difference between a canoe and a kayak lies in the way they are built, the way the person navigating the vessel sits and the paddle. In a canoe, sailor sits with his feet drawn to his chest or strapped (if the canoe is so equipped) while using a single bladed paddle to sail. For kayaking, a double bladed paddle is wielded by the sailor who sits with his legs stretched in front of him and his feet are covered by an extended hull. For 2015 I’ve opted to paddle the new Jackson Coosa HD, one of Jackson’s newest fishing kayak models along with the Kraken. As much as I enjoyed the Jackson Kilroy from last fall, I was curious about the Coosa HD due to all of the hype it was getting and had to get a look at it for myself. To say I was impressed is a huge understatement and I knew the HD would be my choice of kayak for the 2015 season. Since ordering and receiving my HD in the new GI Jackson color, I’ve spent some time on the water with it, but we’ll get to that in a bit. First, let me walk you through what I feel is one of the most versatile fishing kayaks on the market, the Jackson Kayak Coosa HD. I get asked a lot about my kayak and with so many people new to the sport, I thought I would take you readers on a little walk through of my Slayer 14.5 by Native Watercraft. 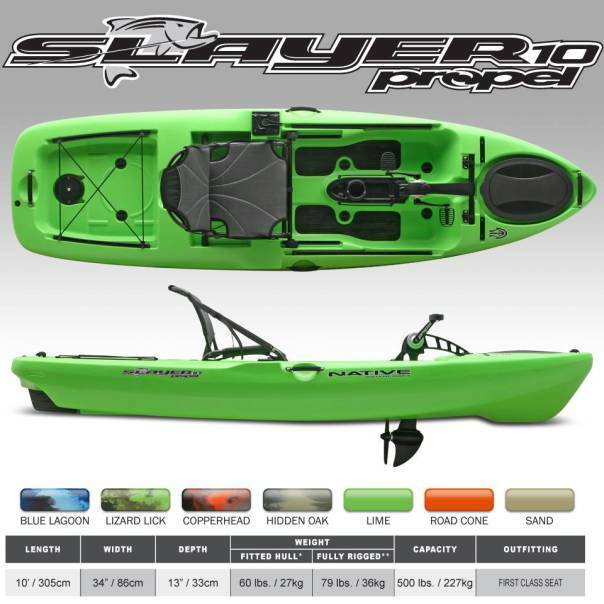 The Native Slayer was created as a sit on top version of their popular Ultimate series sit inside kayaks. Native Watercraft asked their customers what kind of features they would want in a sit on top fishing kayak, the customers responded, Native listened and the Slayer was born. Having been on the market for a year or so now, the Slayer is offered in 12′ and 14.5′ paddle versions as well as their very popular Slayer Propel 13 peddle kayak. Hitting the market this year, as I’ve written in a past post, is the Slayer Propel 10, which once again I think will make a great river fishing kayak. A lot of the features I’m going to discuss below on the Slayer 14.5 are the same on the other models, so keep that in mind if you’re shopping for a shorter kayak. Let’s get started with the front of the boat, shall we? The crew at Native Watercraft simply amaze me with their never ending interest in creating kayaks for all situations. Their upcoming ten-foot version of their popular Slayer Propel peddle kayak seems to be a future contender for best river kayak on the market in my opinion. While I won’t get to test drive one until my local dealer gets one in stock, I’m anxiously awaiting sometime in the cockpit of this new addition to the Native lineup. The word from Native is the Propel 10 will be even more stable than the already super stable current Slayer models, more maneuverable than the standard Propel in the 13′ 2″ version, and a lot lighter in weight. With estimated weight coming in somewhere around 69 pounds, it will most likely be the lightest peddle angling kayak on the market. Can you imagine how easily a kayak like this would be to toss into your pickup truck and head to the river for an afternoon of fishing?!? I like it! Jared Seiler (USA) – Entry for Best Line (Waterfall), Powder Hole, Wapwallopen from Rider of the Year Awards on Vimeo. The Rider of the Year Awards celebrate and showcase the best in whitewater kayaking. Made in Canada Episode 4 | The Ashlu from NRS Films on Vimeo. Living in Vancouver, British Columbia allows kayaker and chemist Steve Arns to pursue his career and his sport with equal passion. When work is done, Steve loads up his kayak, leaves the city and heads to the river. Join Steve and his friends as they shred the Box Canyon of the Ashlu, a Class V kayaking classic right out Vancouver’s back door. Substantial TV Ep. 6 “Ragnarök” from Substantial Media House on Vimeo. Ragnarök, in Norse mythology, was the predestined death of the gods. A three-year winter led to the epic final battle where the gods and the frost giants fought to their deaths and the end of the world. Ragnarok marks the end of the old world, and the beginning of the new, current world. After spending a month in Norway in 2012, we returned in 2013 ready to battle the immense whitewater that Norway has to offer. With different water levels we were able to paddle some new stuff, and a lot of the same quality runs we paddled last year. With an awesome crew, kayaks, and cameras we set out to find our own meaning of Ragnarök. Coming across some of the most amazing views, good times, fun and incredibly scary whitewater of our lives… It was true our souls were re-birthed, and re-defined after another amazing time in the land of the Vikings. Kayaker saved just before swimming over a 60 foot waterfall!! from David Fusilli on Vimeo. Two Kayakers run a 20 foot waterfall that leads into a 50-60 foot waterfall. The first 20 foot waterfall goes terribly wrong for the second paddler who swims just above the 50-60 foot waterfall. The second paddler is clinging to a rock wall while the first paddler gets a throw rope out of his kayak and saves the second paddler from swimming over the second Big waterfall. Choosing the best fishing Kayak for your needs can be a daunting process. When it comes to selecting the right yak, you need to consider where you will be using it, what you will be using it for and your own weight and strength. A Kayak that will be great for long distance cruises probably wont be so good at navigating a narrow river with lots of white water and visa versa. Do you want to find the best fishing kayak out there for your needs? Bass Fishing on lakes and creeks? Cobia on the oil rigs? Whatever you need, let our chart show you what the best fishing kayak is for you then read our reviews! Why fish from the shore and not get to the best spots or spend huge money on a boat when you can get into the best fishing from a kayak? When fishing from a yak, you get the best of everything. Fish where the fish are, whether you want to get out to the rock piles where the lunker bass lie, go 10 miles out to hunt tuna or maybe just troll a lure to catch some fresh lunch while paddling from place to place. If you’re reading this, you’re obviously someone who seeks adventure and wants to be close to the action. Trust me when I say that a 10lb fish from yak is like a 50lb fish from a boat. Compare how un-special 60mph in an SUV feels is to how fast and fun 60mph is on a go-kart! Have you ever been fishing from the shore with not a fish to show for your efforts, watching the birds crash diving and fish leaping only 300 yards offshore and wished you could be there? Well with a kayak you can glide stealthily into the madness, no engine to spook the shoal. With so many kayaks out there on the market and a bewildering amount of information it can be hard to make a decision on what really is the best fishing kayak for you. The chart below and the analysis that follows will help you decide.